2016-17 Annual report (July 2017): As this was then believed to be the final annual report for Computers in Homes, the then Whanganui Regional Coordinator shared the stories of many of our Computers in Homes families rather than just one. 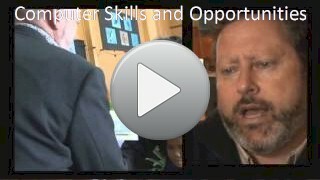 Taihape Area school reports that the school is connecting with their Computers in Homes families in a whole new way. Parents are coming into the school. They connect on many things not just disciplinary matters. Chelle, a Taihape Computers in Homes student said she is now much more involved with the school and now uses technology in a much wider way for example supporting her sports coaching. Her children are doing better at school from the technology being at home. 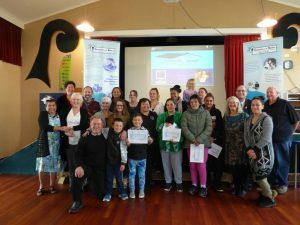 Final Farwell from Whanganui May 2017 Several of our key staff, supporters, steering group and graduates gather for a final photo. Students from our Te Pae Tata class in Ohakune who graduated in May are reporting they are so much more enthused and excited by technology. They can see the point of engaging with it. It does not frighten them anymore. They are looking forward to sharing it with their kids and grandkids. Parents share regularly that they would not be able to have the internet if we had not helped them. Whether it is the monthly payments or bad credit there are still many barriers to people having the internet at home. As for technology, many parents had it at some stage but could not afford to get new technology. Now they see the point of technology and the benefits it brings to the home. Learning together, sharing together and seeing the practical way technology supports education and life is one of the critical things they all share they get from the programme.